The whispering gallery is located in the dome of St Paul's Cathedral, London, and has the curious property that if two people stand at opposite sides of the gallery, at a distance of 42 meters, and one whispers into the wall of the dome, then the other person can hear what is being said. If the two individuals face one another and continue the conversation across the expanse of the dome they can no longer hear the words and have to resort to shouting. The reason for this strange effect is that the sound bounces along the wall of the gallery with very little loss, and so can be heard at a greater distance than if the curved wall had no been present. 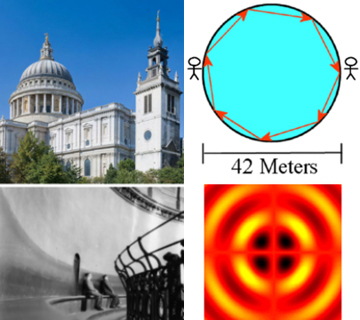 It can be viewed that there is a narrow region near the edge of the dome where the waves propagate most efficiently, and this is known as a 'whispering gallery mode' in honour of gallery where it was discovered. In recent times whispering gallery modes have found new fame with the development of nano-optics. In the modern version of this effect light is made to bounce around the edge of a glass sphere. This setup appears to be very similar to that already depicted, although there are some subtle differences. Under normal conditions when light reaches an interface some of it will be reflected and some will be transmitted. However, if the light is in glass and is travelling back into air there is an angle at which the light can no longer be transmitted and it suffers total internal reflection - exactly 100% of the light is reflected, a very useful effect to reduce losses. When light is travelling around the edge of a sphere it will be total reflected at each bounce, and so propagate with little loss (in fact a very small amount of light leaks out with each bounce due to the curved surface, but this get very complicated so it will be ignored for now). Since the light will make many millions of circulations of the sphere before being absorbed it will undergo interference with itself. This means that only whole numbers of wavelengths of light can 'fit' around the edge of the sphere. This selectivity causes discrete modes, known as whispering gallery modes, to exist in the cavity, and these modes are of the lowest loss anywhere in existence. The problem when studying whispering gallery modes is that the low loss makes it very hard to get light into- or out of- these modes. In our work we placed light emitters around the edges of the sphere, when pumped with a laser these emit light directly into the whispering gallery cavity mode, so no coupling is required. To observe the output light we rely on the fact the spheres are not quite perfect and so some light is scattered out. From the spectra of this light we discover that only certain wavelengths are strongly present, as expected, each corresponding to a different number of bounces around the spheres circumference. C.E. Finlayson, P.J.A. Sazio, R. Sanchez-Martin, M. Bradley, T.A. Kelf, J.J. Baumberg.